Although this one is probably a no-brainer, our discounts and deals help to save you a considerable amount of money on your vacation! This means that you will have more funds to spend on other areas of your Smoky Mountain vacation, such as travel expenses, dining out, attraction admissions and more! When you take advantage of our deals, you will be delighted to see how much cash you have left in your vacation budget! We often run deals where you can enjoy an extra night or two for FREE simply by staying with us! These deals are offered as a special “thank you” for choosing Hemlock Hills Resort Rentals for your Pigeon Forge or Gatlinburg vacation. These specials allow you to extend your vacation for no additional cost, which means more time to enjoy the beauty of the mountains! If you have had your eye on one of our cabins but thought it might be out of your budget, you will be pleasantly surprised to see what you can afford! While all of our cabins offer comfortable accommodations and excellent amenities, you might have been thinking about upgrading from a one bedroom cabin to a two bedroom cabin. After taking a look at our Smoky Mountain cabin deals, you might just discover that the upgrade isn’t so expensive after all! If you take a look back at your calendar from the last year or so, try to find out how long it has been since you took a vacation. If it has been 6 months or more, you are definitely due for a relaxing getaway from your daily routine! If the appeal of the Smoky Mountains doesn’t provide quite enough incentive, we hope that you our special deals will encourage you to travel! It has been proven that a vacation helps to relieve stress, so check out our latest discounts to plan your next trip! When comparing our cabin rates to a traditional hotel room in Gatlinburg or Pigeon Forge, you may be shocked to see that our cabins are a better deal! This is especially true when you add in the value of separate bedrooms, full kitchen, hot tubs, game rooms and more! Our special discounted rates make this an even sweeter deal, so forget the hotel room and enjoy the comfort of a cabin from Hemlock Hills Resort Rentals! 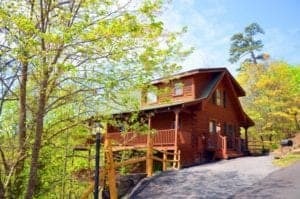 Take a look at all of our Smoky Mountain cabin deals today to find a great deal for your vacation to the Smokies! We look forward to seeing you soon at Hemlock Hills Resort Rentals!